The Procuraduría General de la Nación represents the citizens before the State. It currently has around 3,400 employees and its mission is to oversee the procedures of the State, abiding by the laws and the functions it has according to the 1991 Political Constitution. Its main three goals are: 1. Preventive function: this goal is directed towards "alerting" instead of "punishing", watching over government employees. 2. Intervention function: this is oriented towards defending the rights on behalf of any Colombian authority (religious, military, governmental, judiciary, police, civil, agricultural or any other kind). 3. Disciplinary function: this goal is focused on the sanctions carried out by violations of one or multiple individuals who, in office, have carried out improper activities as government officials. The flag is the logo with the Colombian Coat of Arms (without the motto) on white background. Screenshot from RCN news channel, see the flag on the right of the image. This is the flag of Registraduría Nacional del Estado Civil (Civil State National Registry). Official website at www.registraduria.gov.co. This government body is in charge of registering all civilians, give them their ID's, pass laws regarding these subjects to Congress, classify and file these information, and also manage the Consejo Nacional Electoral (National Election Council, abbreviated CNE, official website at www.cne.gov.co). 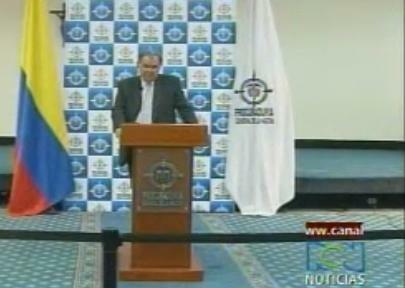 At the same time the CNE is in charge of all matters related to the election process in Colombia. The flag of the Registraduría (as it is commonly known), is a green over white flag (internal ratio 1:1) , pretty much like the flag of the Department of La Guajira, but the shade of green resembles more that of the flag of the Department of Antioquia, plus the Coat of Arms on the center. 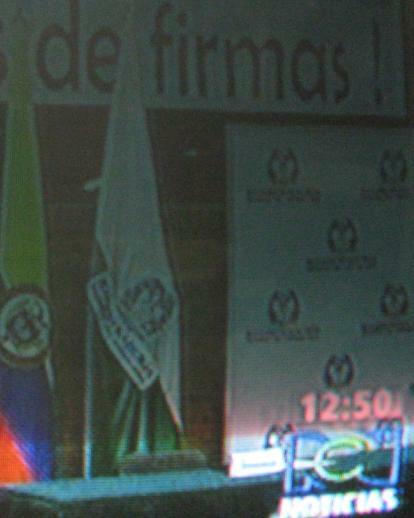 On August 6, 2008, in a news broadcast by local channel RCN an additional flag of the Civil State National Registry was seen. The flag is the same as the one reported previously, the only difference being that this variant has the name of the government organization below the coat of arms, as "REGISTRADURIA" on black capital letters, and in smaller capital letters "NACIONAL DEL ESTADO CIVIL" in black as well. There is one more difference, namely that the order of stripes. Flag reported previously is green over white, but flag on attached picture seems to be white over green. The SENA flag is the logo on white background. The logo is composed of a cogwheel (which symbolizes the industry as an economic sector, a caduceus, which stands for commerce and the coffee grain, which represents the primary or agricultural sector). The logo can be seen here and the flag can be seen here. 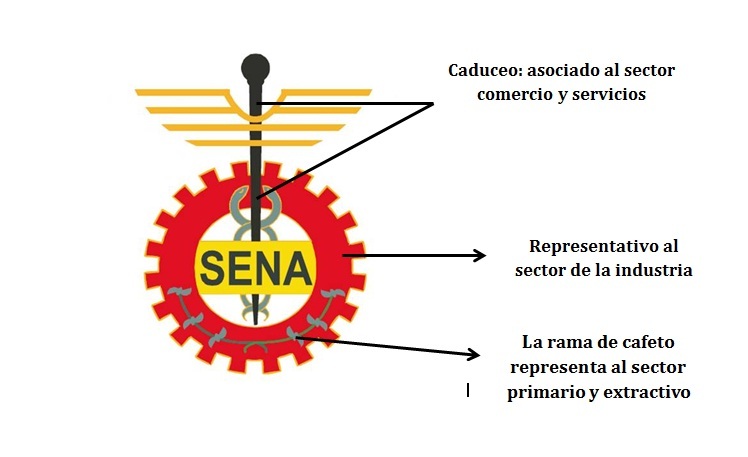 The SENA is an institution which focuses on the development of professional education programs with the aim of achieving social development in Colombia and to promote employment through alliances with companies. The SENA was established by Decree No. 118 of June 21, 1957, during the government of the Military Junta of General Gustavo Rojas Pinilla and currently has branches in all the 32 Departments of Colombia. 2. Comité Operativo Nacional (National Operational Committee), which is executed by the Defensa Civil. The actions are coordinated through Comités Regionales (CREPAD's, Comités Regionales de Prevención y Atención de Desastres, Regional Committees on Prevention and Handling of Disasters) and Comités Locales (CLOPAD's, Comités Locales de Prevención y Atención de Desastres, Local Committees on Prevention and Handling of Disasters). The SNPAD evolves into the SNGRD (Sistema Nacional de Gestión del Riesgo de Desastres, Disaster Risk Management National System), established by Law 1523 of April 24, 2012 and in turn, the DGPAD evolves into the UNGRD (Unidad Nacional para la Gestión del Riesgo de Desastres, Disaster Risk Management National Unit) through Decree No. 4147 of November 3, 2011). 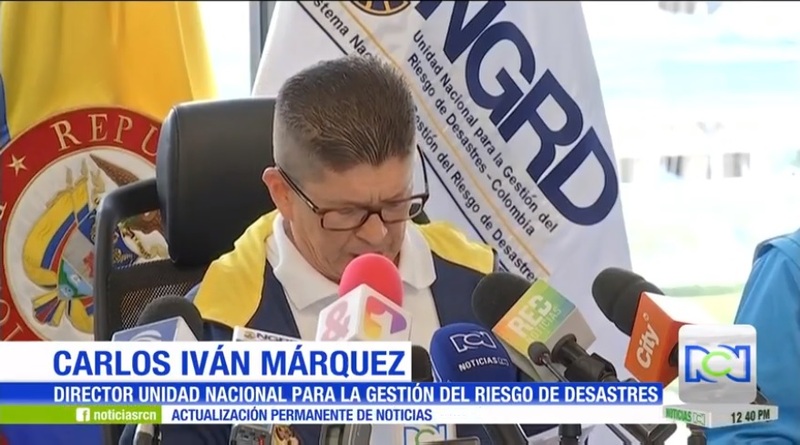 The SNIGRD (Sistema Nacional de Información para la Gestión del Riesgo de Desastres, Disaster Risk Management National Information System) is the actual materialization of all this framework of cooperation and coordination that the SNGRD comprises. There's photographic evidence that two flags exist regarding this topic (that is the SNGRD and the UNGRD), which suggests that the SNGRD (which used to be called SNPAD) has also its own flag even though it is not an organization per se, which features this logo on a blue horizontal flag, as seen in this picture in which the blue flag is seen, along with the UNGRD flag (on the right). The flag of the Colombian Aviation Authority (its official name is UAEAC, or Unidad Administrativa Especial Aeronáutica Civil, or Special Administrative Unit Civil Aeronautics, usually shortened Aeronáutica Civil or Aerocivil - official website: http://www.aerocivil.gov.co). Yesterday I saw an alternate flag of Aeronáutica Civil. The flag has the same color structure, the only difference being that around the logo it reads in golden capital letters REPÚBLICA DE COLOMBIA and below it reads in golden capital letters AERONÁUTICA CIVIL. Image taken from this article: http://economia.terra.com.co/noticias/noticia.aspx?idNoticia=201103041925_TRR_79558812). The flag of the UNGRD is seen here (second flag from left to right). It is a white horizontal flag with the logo in the middle. A variant flag is a white horizontal flag with the logo (first from left to right: http://portal.gestiondelriesgo.gov.co/Especiales/img/FranjaUNGRD.png).